I picked up a Wii U system for the kids and we have definitely been enjoying it. First impressions are solid. Setup is pretty simple and the gamepad charged up while we had dinner. As with quite a few devices I’ve owned the system wanted to connect right away to check for an update. Though it happened again with each of the two games we have as well. 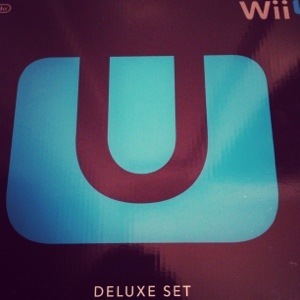 We have Nintendo Land (bundled) as well as Super Mario U…. I have no idea what the nature of the updates were but can tell you that they took quite a while to download – particularly the initial system one which failed actually a handful of times. I had to eventually consult the online support to find out that it might take a few tries and in fact the download resumes with each connect. 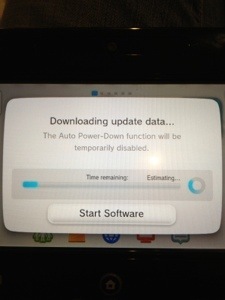 Unfortunately all this downloading kept the kids on edge the whole time. All they wanted to do was play Mario. Today we’ve definitely spent a considerable amount of time playing Mario and with the downloads behind us, the experience has been great. Nintendo definitely has a winner here. Graphics and sound are vastly improved and I’m thankful the prior controllers work along with all our games. update I’ve got YouTube and Netflix loaded up and they look great! Seriously good. YouTube actually has a pretty sophisticated UX … Easy access to subscriptions and watch later lists. The WSJ has a report today about the challenge in selling GoogleTV to traditional players in the TV business. This should not come as a surprise to anyone given the long history of resistance to change from media companies in general. In recent weeks, Google has met with officials of TV networks including ABC, CBS, Fox and NBC to encourage them to work with the service, according to people familiar with the matter. Content owners, though, are skeptical that Google can provide a business model that would compensate for potentially cannibalizing TV owners existing broadcast businesses. I still don’t see the problem this is solving even as a technology early adopter. I don’t find myself wishing I could more actively search on TV. I take a quick spin and either find something of moderate interest or just tune out. While the idea is not a new one, only Apple has really “succeeded” at bringing a successful vision of their digital home ecosystem to market with a good degree of success.Â Microsoft only lightly pushes their version today though I’m figuring quite a bit will change when Windows 7 arrives for release. Asus is actually in an interesting position.Â They sell both Windows as well as Linux products and offer some very big bang for the buck.Â The customers I’ve come across (mainly on the netbook side) are quite brand loyal and it would be easy to see how a lower cost mobile device could also be added as a control point in the home. Didnâ€™t Microsoft fail at this vision with WebTV, I asked. Now the technology is much better, Mr. Shih replied. To Mr. Shih, thereâ€™s no reason to stop at the TV. And how will you control all these screens? I’ve always been excited by the prospect of the digital home and will be quite interested to see how this pans out.